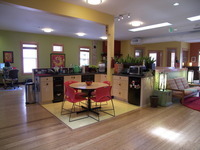 This client's objective was to have a "green" , fun and inspiring office space for their foundation. Here we see the Lunch Room - Centered in the open floor plan, as well as the "Pod" - An area where employees can chill out. Most furniture was from owners and was repurposed and recovered for the office space. As well as using environmentally friendly finishes and paint. The "Pod" - Area where employees can chill out. 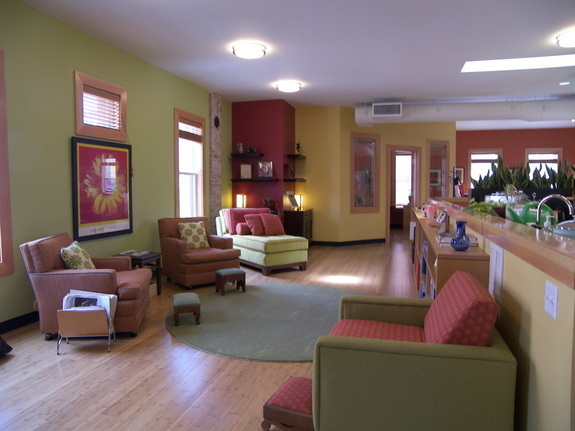 Most furniture was from owners and was repurposed and recovered for the office space. Bamboo Sink in Bathroom with recycled glass tile backsplash. We needed to use all sustainable products in this office build out and found bamboo sinks for the office bathrooms. View from back of the space looking towards the front area. Shows how planter is used as a divider between areas. This is a great shot of the overall workspace showing custom planters to divide some areas. The planters were made from salvaged city tree's.